Our family has a standard breakfast rotation. Weekdays is a bowl of cereal, oatmeal or turkey and cheese sandwich. Rarely do we deviate this. Weekends on the other hand tend to be more elaborate. This is a kind of deal that I have with the kiddos. Eat your cereal and on Saturday and Sunday I’ll make something delicious! Route 1) call up the local French-ish bakery and have them deliver croissants, baguettes, apple turnovers, and other flaky delicacies. I like this route. No work involved and easy clean up. Route 2) This will require a bit of premeditation. The worst question that can be asked in a Recipe Nomad’s house is what sounds good for breakfast? I literally have a 60 minute window between when I open my eyes and when my family expects to be served. That’s not a lot of time if you have to dig for ingredients, run to the market for tomatoes or whatever then rush back to prep it. By this time I have 3 kids screaming and trying to sneak in the pantry for Oreos. For Route 2, I always have stocked the ingredients to make waffles, pancakes and a traditional Lebanese breakfast. These 3 meals will suffice to appease the masses around here. 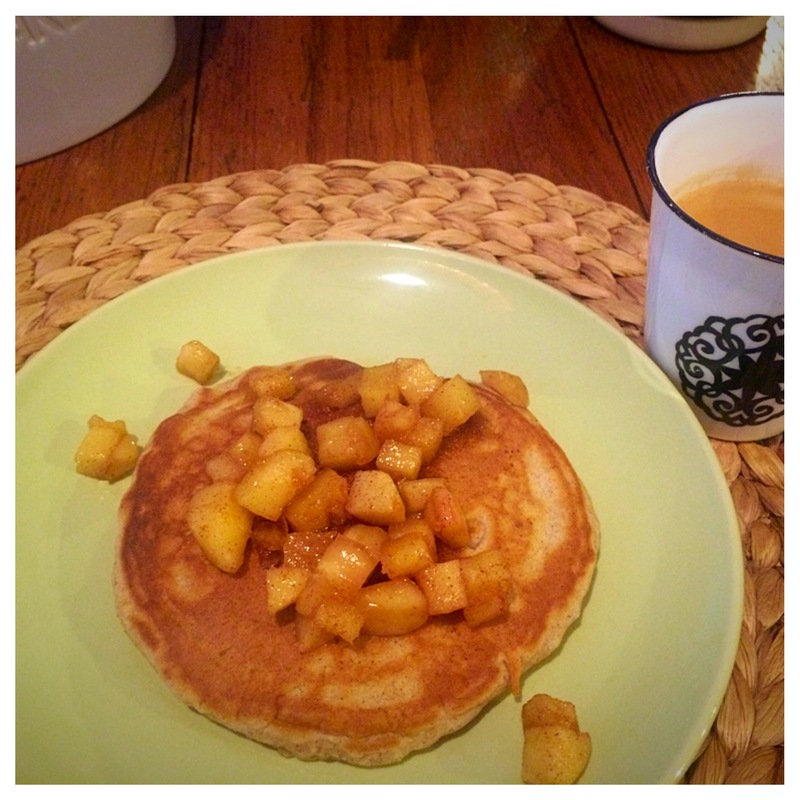 Today I was in the mood for pancakes and since I still have a few apples left I decided to get a bit creative and whip up a batch of Cinnamon Pancakes with Apple Topping. Now I always eat one pancake and resist the urge to take a second or third but today was different. 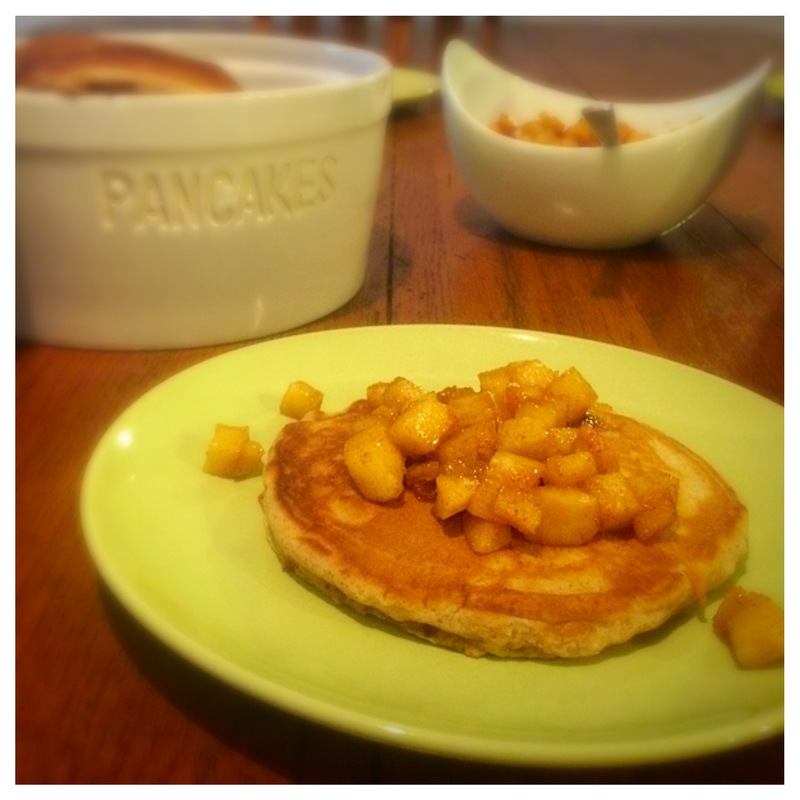 Oh my these pancakes were delicious and with the Apple Topping I completely omitted syrup. I mean come on.. Apples? So Healthy as I willfully ignore the brown sugar and butter! I used my electric skillet to make the pancakes, this way I can do about 5 at a time. If you do not have an electric skillet you can simply use a pan on your stovetop. Preheat oven to 200F (95C). you will use the oven to keep pancakes warm as you make the rest of the batter. Buttermilk: Whisk together milk and vinegar and set aside while you prep the rest of the ingredients. 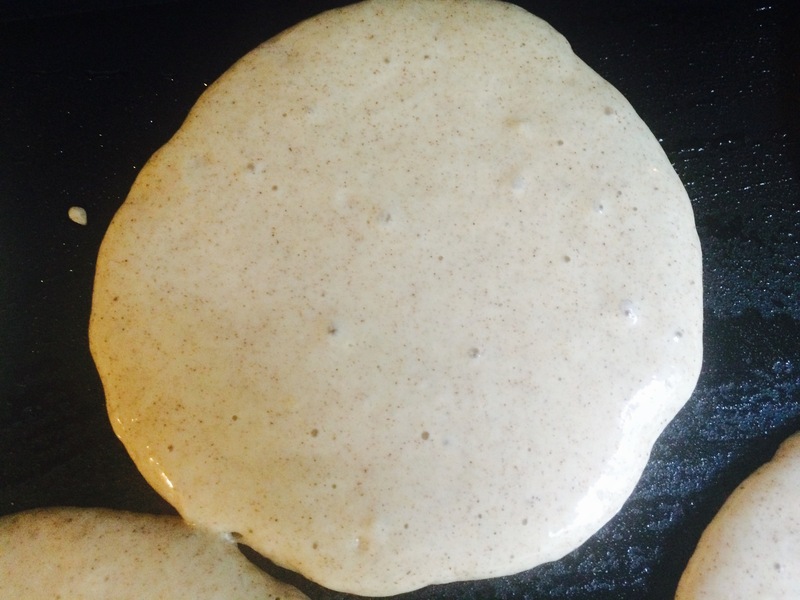 Pancake Batter: Combine all dry ingredients. Add eggs and buttermilk and stir the batter until combined. Batter should be lumpy. 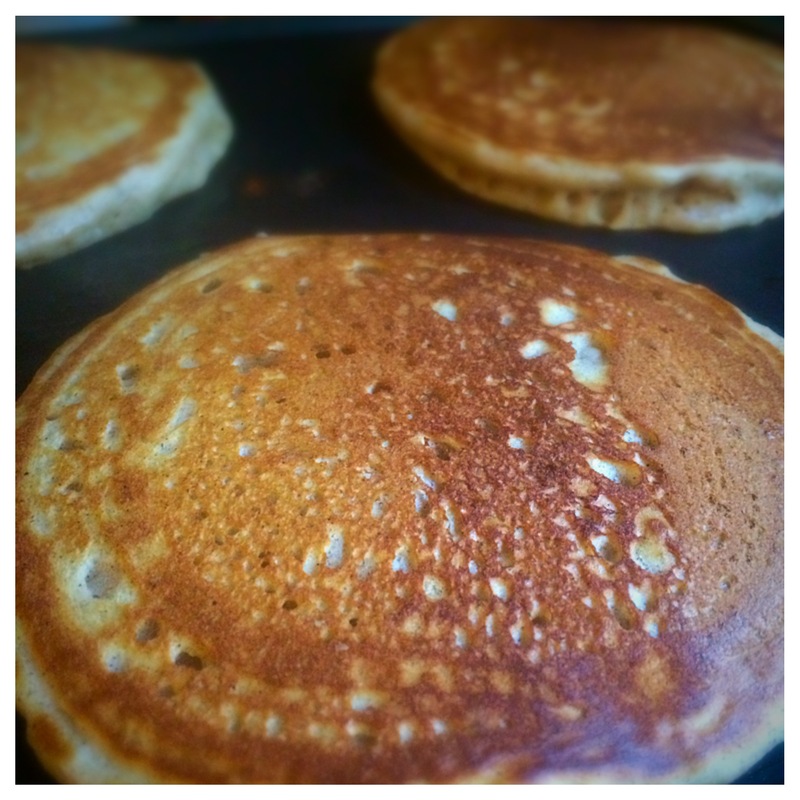 Making Pancakes: Lightly oil your skillet and turn it to 375F (190C). Using a 1/4 cup measuring cup, pour batter onto your skillet. Cook first side for 2 minutes and flip when bubbles form. Cook the other side for about 1-2 minutes. Remove from heat and keep warm in your preheated oven as you continue making the pancakes. Apple Topping: In a medium skillet, heat butter, apples, cinnamon and brown sugar, stirring occasionally until apples are tender but not mushy. Serve Apple Topping over warmed pancakes.